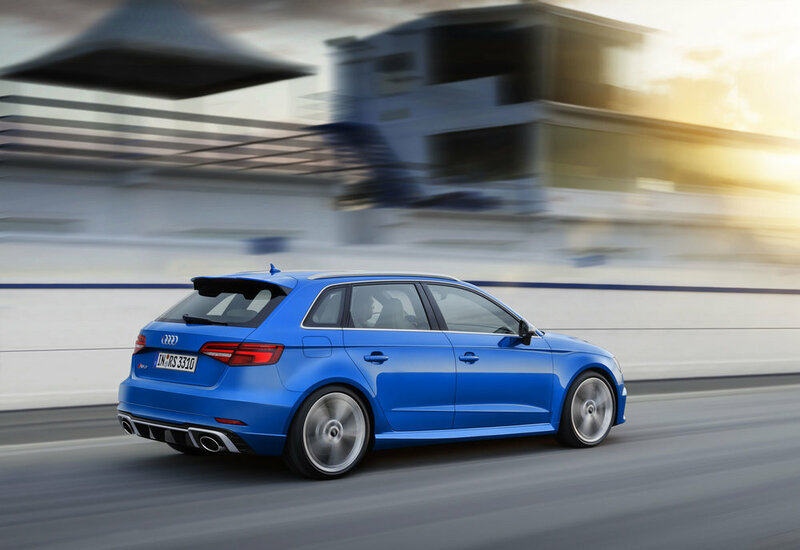 The Audi RS 3 is being reintroduced in five-door Sportback guise to sit alongside the recently launched RS 3 Saloon. At next month’s Geneva Motor Show the five-door RS 3 Sportback will make its comeback featuring a series of design and connectivity upgrades and power from the latest 400PS five-cylinder TFSI engine. The latest 2.5 TFSI engine delivers 33PS more than its predecessor – and is 26 kg lighter thanks to its aluminium crankcase, among other features. Its maximum torque of 480 Nm (354.0 lb-ft) is available from 1,700 rpm through to 5,850 rpm. The engine is mated to an S tronic seven-speed dual-clutch transmission and quattro permanent all-wheel drive based on an electro-hydraulic multi-plate clutch which distributes the drive torque variably between the axles. This translates into a 4.1-second 0-62mph sprint time, with a top speed limited to 155mph – unless the optional dynamic package plus is specified, enabling a de-restriction to 174mph! On the economy front, in the New European Driving Cycle (NEDC) test, the RS 3 Sportback returns 34 mpg, which equates to CO2 emissions of 189 g/km. Externally, flared front arches accommodate a wider front track and distinguish the RS 3 Sportback from the regular A3, along with a 25mm lower ride height and 19-inch alloy wheels fitted as standard. LED headlights are standard with matrix versions available as options. At the rear there’s an elongated RS roof edge spoiler, a diffuser insert and the RS exhaust system’s large oval tailpipes. Inside, there are sport seats with RS seatback emblems in black Nappa leather are standard, and for even greater support RS sport seats with more contoured profiles and integrated head restraints for the driver and front passenger are available as options. The Audi Smartphone Interface is now standard, enabling users to access selected apps on their handsets from the car’s onboard monitor via Apple Car Play and Android Auto, and an LTE module brings the Audi connect services on board, including navigation with Google Earth and Google Street View, as well as information on fuel prices, weather, travel and traffic. The Audi MMI connect app lets users transfer their smartphone calendars into the MMI system. Drivers can also send destinations from Google Maps and special destinations to the navigation system, and also stream music from the internet. In addition, the navigation system includes a Wi-Fi hotspot that enables passengers to connect their mobile devices to the internet. Order books for the RS 3 Sportback and the RS 3 Saloon will open in the UK from the summer, with pricing for both variants to be confirmed closer to that point. Deliveries are expected towards the end of the year.